This post is definitely not an April Fools. 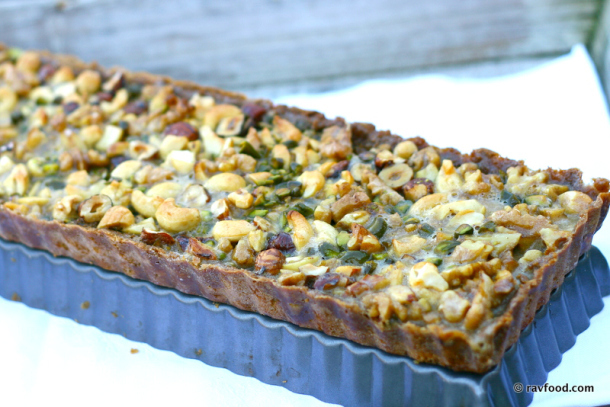 On the contrary, I feel that this mixed nut caramel pie is one of my best ever low carb baked goods. 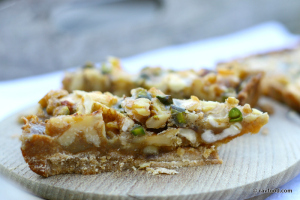 The pie in the photos is completely sugar and gluten free – and the taste is incredible. 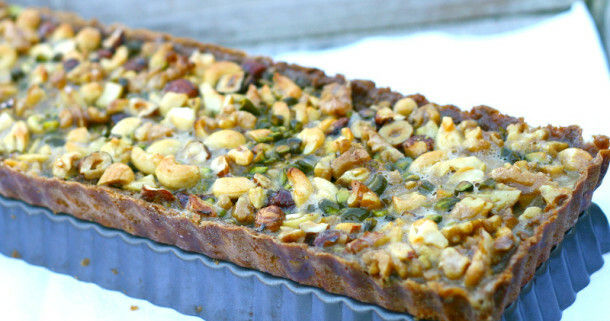 The pie has a crunchy crust, lots of healthy nuts and a delicious sweet taste of caramel. You could choose to cover the crust with dark chocolate which would complement the sweet pie. I used Fat-reduced Almond Flour for the pie. It should be possible to use regular almond flour – I just haven’t tried it. The pie needs to be served completely cooled so consider baking the day prior to serving. Use a 13 3/4″ x 4 1/2″ pie pan, or alternatively a 8″ x 8″ pan.